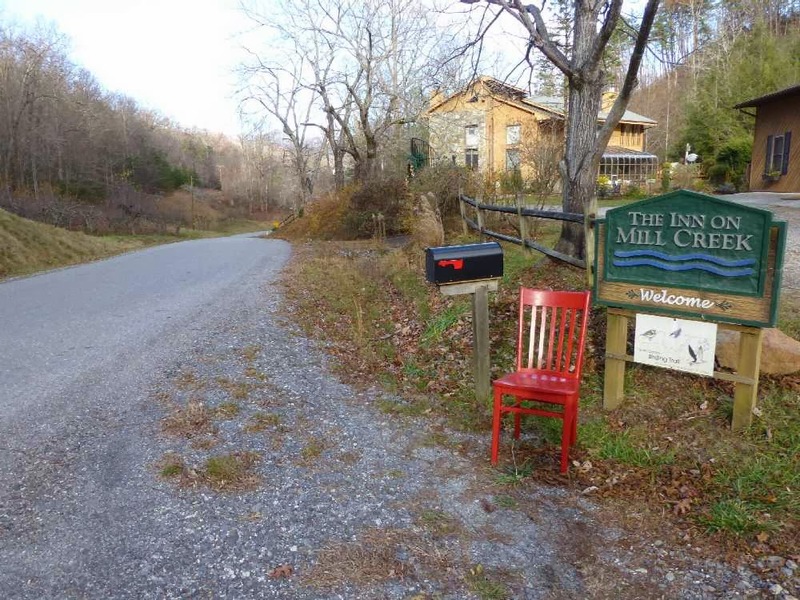 We hosted a very special guest at the Inn on Mill Creek Bed & Breakfast from November 23-26, 2013. 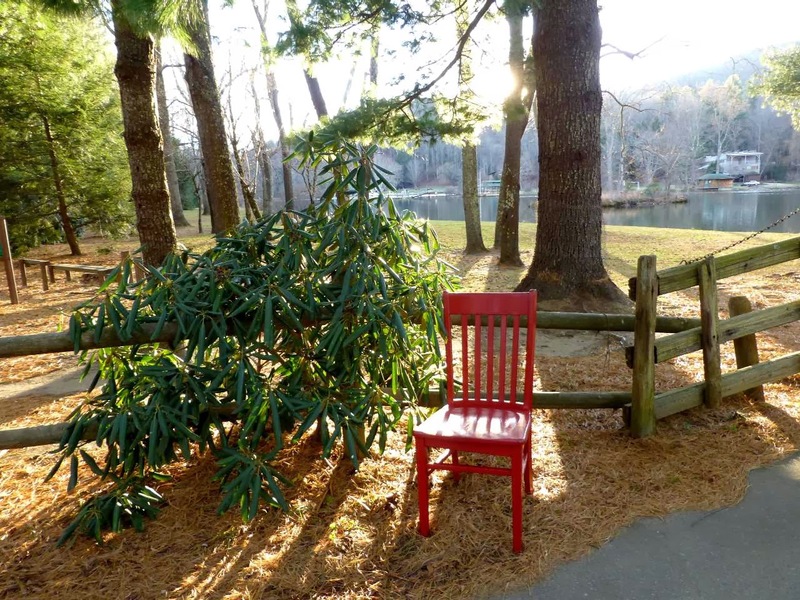 The Red Chair is a travel icon that has been making its way from the east coast to the west, traveling across the country and staying at B&Bs along the way. 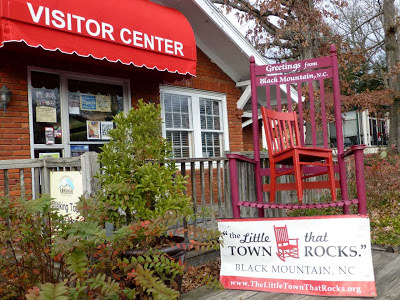 You can learn more about it at www.redchairtravels.com. 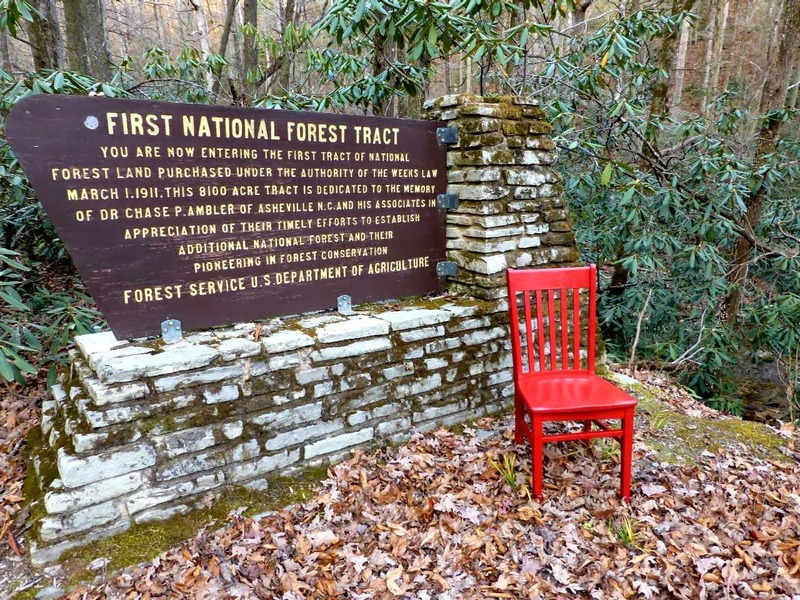 Red was quite the adventurer while it was hanging out with us last week, and who wouldn’t be, with all the sights to see on the Blue Ridge Parkway, in Black Mountain and around Old Fort/McDowell County? 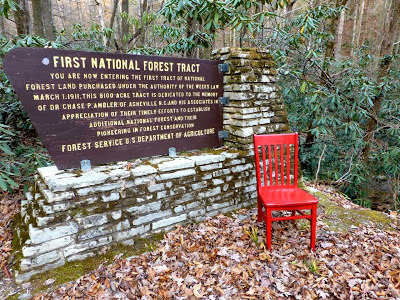 Since our B&B is inside Pisgah National Forest, we decided to make Red’s first stop the Curtis Creek Recreation Area, which has the distinction of being the first tract of land purchased under the Weeks Act of 1911, enabling the creation of National Forests in the eastern United States. 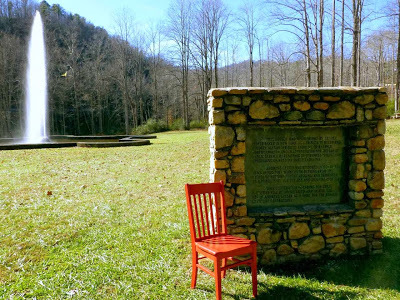 Our area has a lot of wonderful history related to land conservation and preservation, and Pisgah National Forest is part of that, so we were proud to show Red this special area in McDowell County, not too far from the Inn. 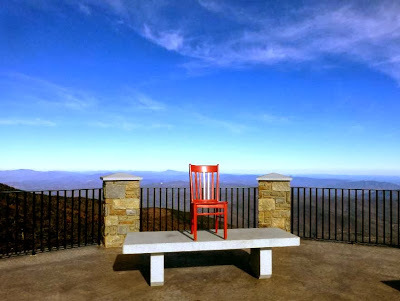 From there, we ventured up to the Blue Ridge Parkway, which we understand Red has seen portions of in Virginia. 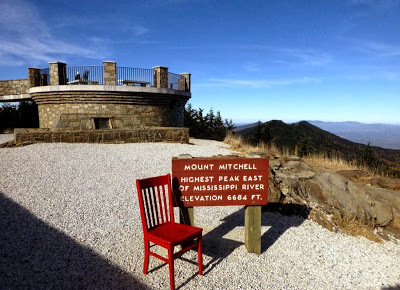 The North Carolina section of the Blue Ridge Parkway runs along the Black Mountain range, which contains six of the ten tallest peaks in the eastern United States. Red just had to see the highest point in the east, so off we went to Mt. Mitchell State Park and all the way to the top of Mt. Mitchell! 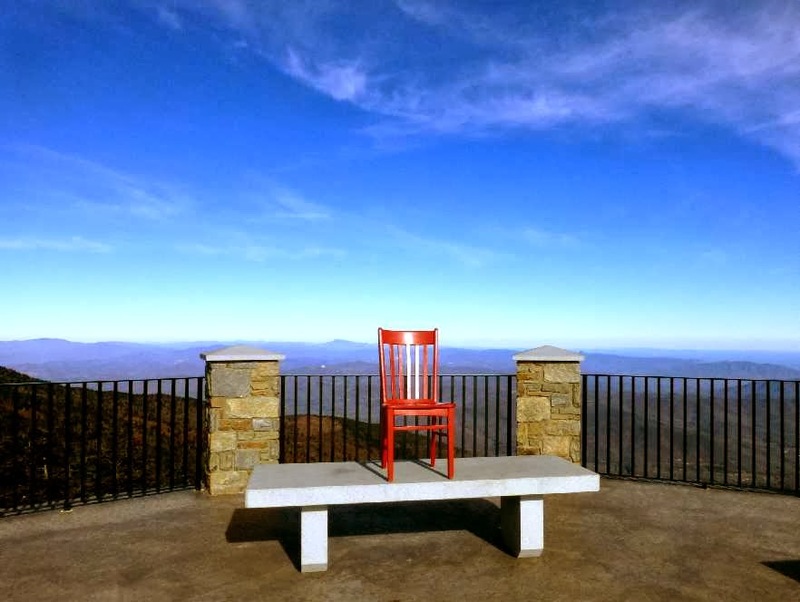 While on the Parkway, we also showed Red the Green Knob overlook, which you can see from the Inn on Mill Creek’s orchard. Green Knob has a great hiking trail to an awesome fire tower (which you can also see from our orchard), but since it was 27(!) degrees, we decided instead to head to lower elevations and warm up a bit. Our last stop for the day was to Andrews Geyser in Old Fort, just down the mountain from the Inn on Mill Creek. In fact, the water for the Geyser comes from the pond adjacent to our property. The Geyser was part of a luxury railroad hotel that unfortunately burned down in 1903, but the Geyser is still there and is now part of a rural town park in front of Mill Creek. During Red’s second day, we ventured into the town of Old Fort, which was the westernmost outpost of the the country during the Revolutionary War era and which also has a rich railroad history dating from the 1800s to the early 1900s. Red waited for a train at the Historic Old Fort Depot (alas, railroad maintenance was being done that afternoon, so no train). 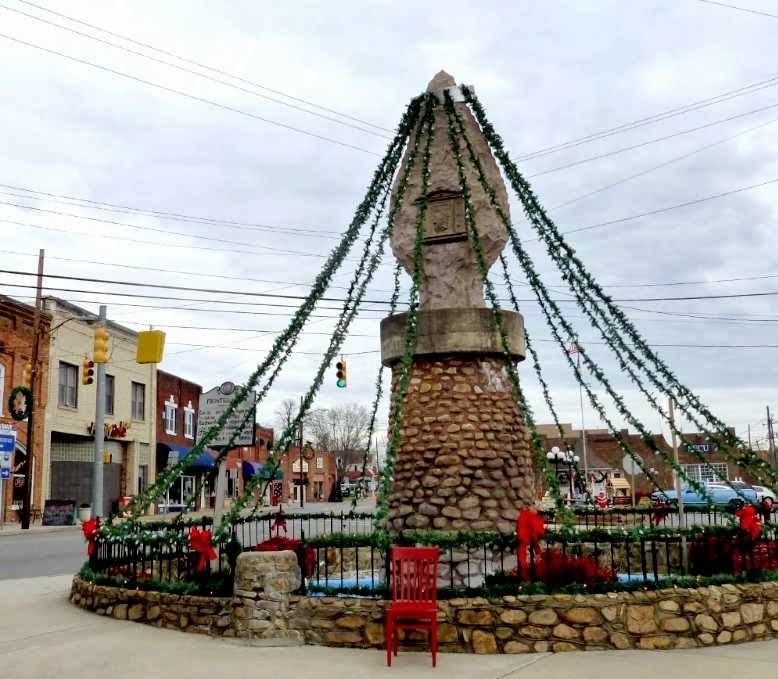 But Red was impressed to see that just across the railroad platform was the hand-carved granite Arrowhead Monument, erected in the 1930s as a symbol of peace between descendents of colonial settlers and the Catawba and Cherokee tribes. Red also saw Davidson’s Fort, which is a replica of the Revolutionary War fort of the same name. 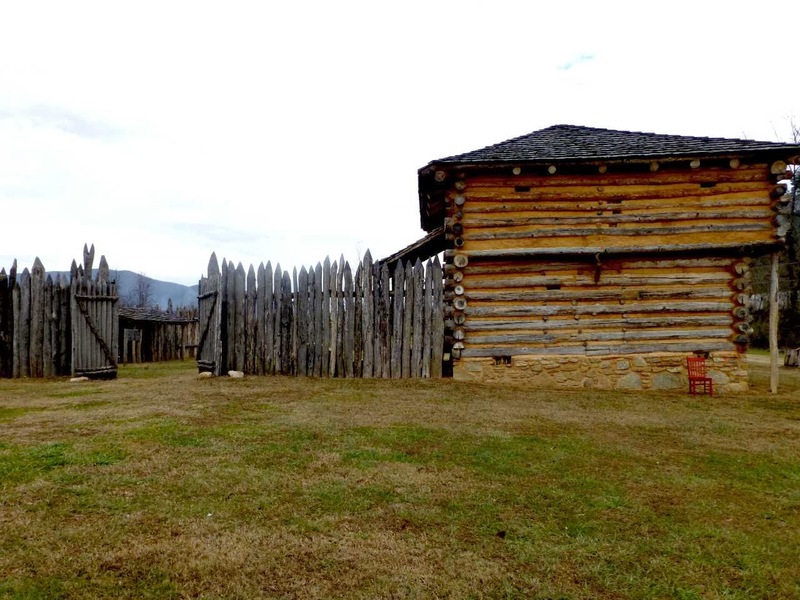 You can learn more about Davidson’s Fort at www.davidsonsfort.com. And then it was off to Lake Eden, west of downtown Black Mountain, which was the former site of Black Mountain College, and now serves as a summer camp and event location, as well as one setting for Nicholas Sparks’ novel, The Longest Ride. 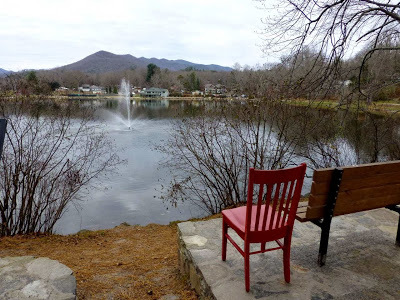 You can see more photos from Red’s visit to Old Fort/McDowell County, Black Mountain, and the Blue Ridge Parkway at our Facebook Page. And follow Red’s journey at www.redchairtravels.com. This entry was posted in Uncategorized and tagged Black Mountain, Old Fort / Andrews Geyser, outdoors by Inn on Mill Creek. Bookmark the permalink.